No one in America has done more observing of more people than Dr. Frank I. Luntz. From Bill O'Reilly to Bill Maher, America's leading pundits, prognosticators, and CEOs turn to Luntz to explain the present and to predict the future. With all the upheavals of recent events, the plans and priorities of the American people have undergone a seismic shift. Businesses everywhere are trying to market products and services during this turbulent time, but only one man really understands the needs and desires of the New America. From restaurant booths to voting booths, Luntz has watched and assessed our private habits, our public interests, and our hopes and fears. What are the five things Americans want the most? What do they really want in their daily lives? In their jobs? From their government? For their families? And how does understanding what Americans want allow businesses to thrive? Luntz disassembles the preconceived notions we have about one another and lays all the pieces of the American condition out in front of us, openly and honestly, then puts the pieces back together in a way that reflects the society in which we live. What Americans Really Want...Really is a real, if sometimes scary, discussion of Americans' secret hopes, fears, wants, and needs. The research in this book represents a decade of face-to-face interviews with twenty-five thousand people and telephone polls with one million more, as well as the exclusive, first-ever "What Americans Really Want" survey. 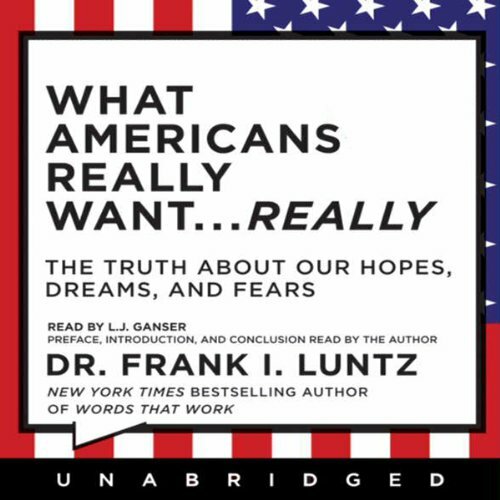 What Luntz offers is a glimpse into the American psyche, along with analysis that will rock assumptions and right business judgment. He proves that success in virtually any profession demands that we either understand what Americans really want, or suffer the consequences. If you have any questions about this product by Hyperion AudioBooks, contact us by completing and submitting the form below. If you are looking for a specif part number, please include it with your message.